Home Editorial Is the International Criminal Court Really Picking On Africa? An African president illegally deposed then dragged before the ICC, is that serving the interest of Africa? 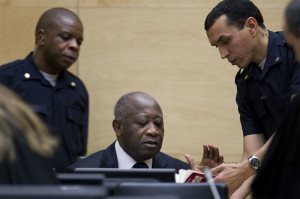 AFRICANGLOBE – Many observers and critics of the International Criminal Court (ICC) argue that the Court has focused entirely on Africa and needs to expand its investigations to other continents. Some cast the ICC as a colonialist tool that is biased specifically against Africans. But while it is true that each of the individuals charged by the Court have been Africans, these arguments overlook and overshadow the fact that African governments have been largely supportive of the ICC and were instrumental in its founding. As many have noted, of the eight active formal investigations that the ICC has opened in it’s over ten years of existence, all of them have been on the African continent. It is easy, then, with just that information, to conclude that the Court and its prosecutors have focused on Africa. But contrary to common perceptions, the ICC’s interventions in Africa have in fact been called for and supported by African states. In four instances – in the Democratic Republic of Congo, Uganda, the Central African Republic and Mali – the situations were referred to the ICC prosecutor by those very states. In those situations where investigations were opened on the volition of the prosecutor, there was also support from African governments. In Kenya, the prosecutor was given evidence of crimes allegedly committed during 2007-08 post-election violence by an international commission established by the Kenyan government. Even then, an investigation was only formally opened after the Kenyan government failed to meet an agreed upon deadline for starting its own prosecutions. Likewise, the investigation in Cote d’Ivoire was supported by the Ivorian government, under the leadership of President Laurent Gbagbo which voluntarily accepted ICC jurisdiction in 2003. The remaining investigations – in Darfur and Libya – were referred to the ICC prosecutor by the United Nations (UN) Security Council, with both referrals receiving support from African states sitting on the Council at the time. Does Africa Support for the International Criminal Court? “My largest constituency is Africa and its state parties. I make every effort to liaise with them and be truly attentive to their concerns,” remarked Ambassador Tiina Intelmann, President of the Assembly of States Parties to the Rome Statute (the ICC’s founding treaty) recently. Her office has carried out exhaustive efforts to respond to any question from African states, whether they are ICC states parties or not. African countries have long supported the idea of an international criminal court. Members of the Organization of African Unity (OAU) and later the African Union (AU) were actively involved in the ICC’s creation. During the 1998 Rome Conference negotiations, OAU Legal Adviser Tiyanjana Maluwa gave two justifications for Africa’s interest in the ICC: the continent’s historical endurance of atrocities such as slavery and colonial wars, and the memory of the 1994 Rwandan genocide, where the international community failed to take preventative action. In Maluwa’s words, these experiences “strengthened Africa’s resolve to support the idea of an independent, effective, international penal court that would punish and hopefully deter perpetrators of such heinous crimes”. This resolve has carried through to the present. African states have routinely responded positively to requests for assistance by the ICC during the course of proceedings. They have facilitated investigations and provided crucial support to their conduct. For example, just last month Rwanda, which is not a state party to the Rome Statute, cooperated in facilitating the transfer of ICC suspect Bosco Ntaganda to the Court. Furthermore, in July 2012, six West African heads of state attending a meeting of the Economic Community of West African States (ECOWAS) in Burkina Faso called for the ICC to intervene and conduct investigations of alleged crimes in northern Mali. The fact is that several ordinary African citizens do not share the same opposing views as some of their leaders on the ICC. While attending an expert roundtable meeting on the African Union, the ICC and the United Nations Security Council (UNSC) in Addis Ababa in March 2013, I was asked why heads of state and senior government officials feel they are entitled to immunity from prosecution? The AU and the ICC: A Shaky Relationship? The AU’s relationship with the ICC is admittedly far from perfect. The AU has supported UN Security Council deferrals of the investigations in Darfur and Kenya, and most notably instructed member states not to act on the arrest warrant for Sudanese President and suspected war criminal Omar Al-Bashir, arguing that he has immunity as a sitting head of state. But that is not the whole story. It is important to bear in mind that institutional relations are complex and take time to develop. As a case in point, the relationship between the ICC and the UN was foreseen in the Rome Statute, but the negotiations of a draft relationship agreement as a basis for discussions between both organizations lasted for two years. No such provisions were foreseen for the relationship between the AU and the ICC, so some tension between the two may be expected.